Number 7 of the 10 TRD2000GT kits they brought to the USA. As far as I know only 30 real kits were made. My car was the second car finished, and was at the Sema Import Auto Salon the following year in the Ryane Motorsports booth. It's had a bit of a hard life with lots of street and track use, but I'm in the process of restoring it right now to it's former glory. Tires are Hoosier R series in 245/35/18 front, 285/35/18 rear. The car is not tuned for a bunch of power by today's standards, but it is tuned for responsiveness and incredibly good handling. 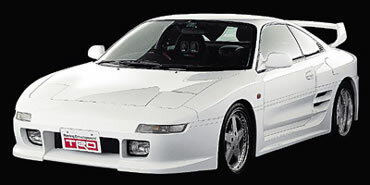 Nice Mr2. I love This color.